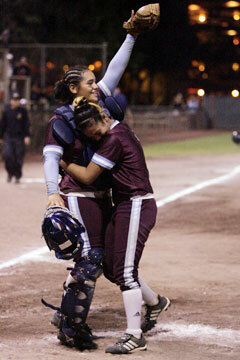 Baldwin pitcher Nicole Alconcel, right, hugged catcher Sanoe Kekahuna after beating Mililani for the Division I title. They have traveled near and far, the heart of Baldwin softball have. The roads for ace pitcher Nicole Alconcel and catcher Sanoe Kekahuna led to a state championship last night. Alconcel delivered another sparkling performance on the mound, and again, she smacked a two-run home run as third-seeded Baldwin edged top seed Mililani 2-0 at frigid Rainbow Wahine Softball Stadium. Alconcel drilled her go-ahead home run well over the right-field fence in the top of the sixth inning to end a scoreless duel with Mililani ace Makani Duhaylonsod. That brought home courtesy runner Jessica Arruiza, who entered the game after Kekahuna had reached base on an error. Just one night earlier, Alconcel's two-run homer and one-hit gem led the Bears over St. Francis 2-0 in the semifinals. "It was the same thing, middle-outside and flat," said Alconcel, who knew it was a goner. "The moment I hit it, I hit it with everything I got." Alconcel, like Kekahuna, was in tears and smiles after postgame trophy ceremonies were completed. "I feel really happy and really sad at the same time. It's over," the Bears ace said. Mililani, the Oahu Interscholastic Association Red Conference champion, finished 15-3. The Trojans managed four hits off Alconcel, who struck out six and walked two. The senior won all three of her starts in the tourney. She pitched 21 innings, allowing one run and five hits. In all, Alconcel struck out 25 and walked eight in a remarkable three-night performance. "We saw Mililani play Iolani (in the semifinals) and we saw most of their batters are overaggressive," the University of California-bound catcher said. "We picked up on that, so we moved all our pitches around." Longtime coach Rudy Souza, along with assistant coach and son Ryan, deferred to the catcher. "Sanoe did a good job. We depend on her. That's what they play for. Coaches are on the bench and the catcher sees everything," said Souza, who retires again on a good note. He left the program due to health reasons after Baldwin's state-title season in 2001. Alconcel and Kekahuna are among nine seniors on a squad that toiled long hours under the hot Wailuku sun for the Souzas. Playing the game year-round, they have competed in Japan and on the mainland. Alconcel played last summer for the San Jose Sting, while Kekahuna caught for the Corona Angels. Alconcel will pitch for UH-Hilo next season. Baldwin's magical season, its first state championship since 2001, closed with a 17-0 record. That same year, coach Rudy Souza stepped down after undergoing triple-bypass surgery. His son, Ryan, moved up from his role as an assistant and worked diligently with the young team, which unofficially included some seventh-grade managers who now are part of the senior crop. Rudy Souza was ushered back into the saddle after son Ryan had to fulfill work obligations, but they and their staff have remained intact. Note: The Division I All-Tournament Team was not available at press time last night.